Dimensions: Bear: 17" x 38"; Monkey: 15" x 36"; Rabbit: 15" x 43"
I bought the monkey for my 4 year old niece. She was immediately in love with the monkey. She told me several times that it matches her shirt. My great grandson loves this pillow! My daughters favorite gift, hands down! Just so unique! The soft and plush fabric is so nice! My grandkids (11, 8 & 6) love their plush pillows!! 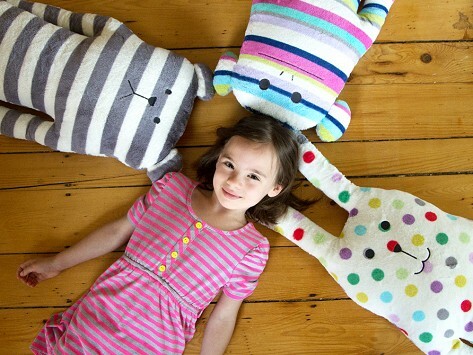 From a Japanese company called Craftholic come three cuddly creatures sure to get plenty of smiles and hugs. Rab the Bunny, Loris the Monkey, and Sloth the Bear are no ordinary stuffed animals. Ranging in size from 36 to 43 inches tall, these snuggly characters are larger than your average teddy bear. Despite their size, Rab, Loris, and Sloth don’t come with a hefty price tag. They're also soft, snuggly and uniquely shaped to double as a place for kids to rest their sleepy heads at bedtime. Created by Tokyo-based designer, Ikuko Yamamoto, each large as life Craftholic character is brimming with personality and signature Japanese styling. Bear hugs, anyone? Or perhaps you’d rather a bunny or monkey hug?